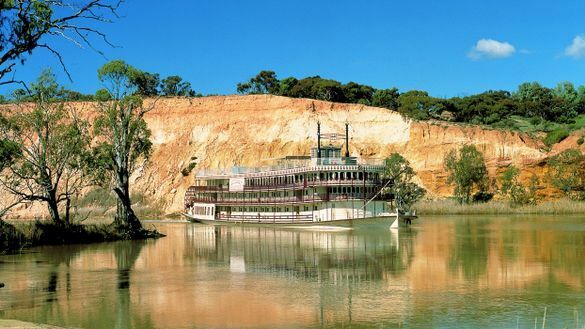 Make the most of the Easter long weekend and enjoy Easter celebrations with family or friends, while discovering the history and beauty of the magnificent Murray River, on a three-night Captain Cook Cruises Easter Cruise, departing Friday 19 April 2019. Cruise the mighty Murray between Walker Flat and Murray Bridge onboard the largest inland paddle wheeler in the Southern Hemisphere, the PS Murray Princess. Accommodating 130 guests, the Murray Princess oozes with the authentic charm of yesteryear yet is equipped with every modern convenience. The Easter cruise is filled with exciting on-shore day trips and entertaining onboard activities. Explore the township of Murray Bridge and its historic Roundhouse. Wildlife lovers can opt to spend the morning visiting the unique Monarto Zoo. See Giraffes, Elands, Zebras, White Rhinoceros, Cheetahs, Lions, Hyenas and Wild Dogs on a private Monarto Zoo Wildlife Tour for only an additional $62 per person. Get up close to the rivers breathtaking 20-million-year-old cliffs and amazing birdlife on a flat-Bottomed Boat ride onboard, 'Dragon-Fly' and learn about the thriving ecology of the river on an informative nature walk at Salt Bush Flat. Enjoy the everchanging Murray River scenery from the open top deck. Relax in comfort in the paddlewheel lounges and watch the paddlewheel turn while admiring the rivers natural beauty including the magnificent towering limestone cliffs and riverbanks lined with mallee scrub, willows and red gum forests. Be treated to a fine selection of food and wine in the ship's elegant restaurant and bar. Start each morning with a hearty hot buffet breakfast and indulge in a two-course or buffet lunch each day. As night falls watch the sun set and enjoy a delicious cocktail before savouring a three-course meal or buffet dinner to the sounds of a live entertainer. The three-night Easter Cruise departs Mannum on Friday 19 April 2019 and early booking saver fares start from $899 per person, twin share. Fares include accommodation, all meals, guided nature walks, eco-excursions, onboard presentations, onboard Wi-Fi, live entertainment, sun deck, bar, two lounges, restaurant and mini gymnasium.